The Joker is a fictional character, a comic book supervillain appearing in DC Comics publications. The character was created by Jerry Robinson, Bill Finger and Bob Kane, and first appeared in Batman #1 (April 25, 1940). Credit for the character's creation is disputed; Kane and Robinson claimed responsibility for the Joker's design, while acknowledging Finger's writing contribution. 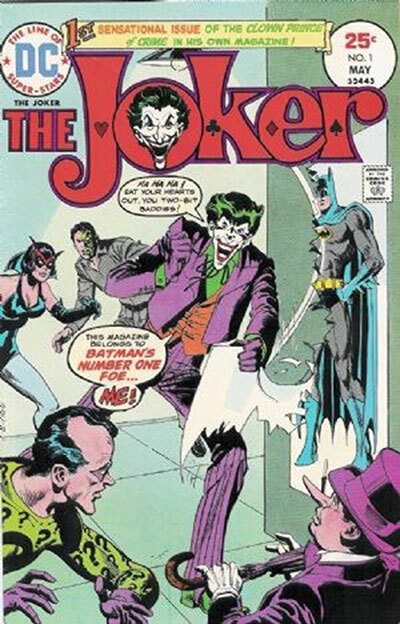 Although the Joker was planned to be killed off during his initial appearance, he was spared by editorial intervention, allowing the character to endure as the archenemy of the superhero Batman. 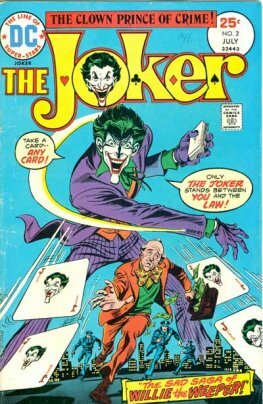 In his comic book appearances, the Joker is portrayed as a criminal mastermind. Introduced as a psychopath with a warped, sadistic sense of humor, the character became a goofy prankster in the late 1950s in response to regulation by the Comics Code Authority, before returning to his darker roots during the early 1970s. As Batman's nemesis, the Joker has been part of the superhero's defining stories, including the murder of Jason Todd—the second Robin and Batman's ward—and the paralysis of Batman's ally, Barbara Gordon. 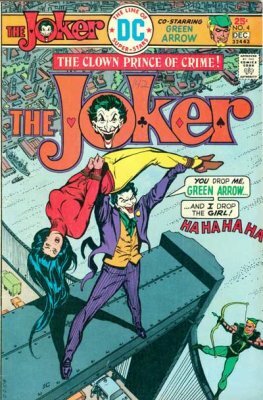 The Joker has had various origin stories during his over seven decades in publication. The most common story is where he falls into a tank of chemical waste which bleaches his skin white, turns his hair green and his lips bright red; the resulting disfigurement drives him insane. The antithesis of Batman in personality and appearance, the Joker is considered by critics to be his perfect adversary. One of the most iconic characters in popular culture, the Joker has been cited as one of the greatest comic book villains and fictional characters ever created. He appears in a variety of merchandise, such as clothing and collectable items, real-world structures (such as theme park attractions) and references in a number of media. The Joker has been Batman's adversary in live-action and animated incarnations, including the 1960s Batman television series (played by Cesar Romero) and in film by Jack Nicholson in 1989's Batman and Heath Ledger in 2008's The Dark Knight (earning Ledger a posthumous Academy Award for Best Supporting Actor). Mark Hamill, Brent Spiner, Michael Emerson, Richard Epcar, Troy Baker and others have voiced the animated character.